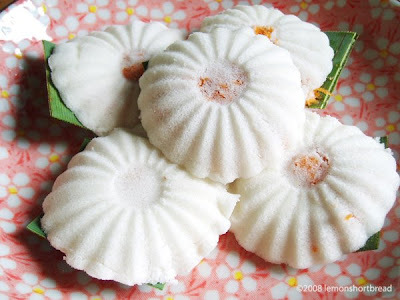 These pretty little babies are called Tu Tu Kueh (or Kuih Tutu) and I got them from the night bazaar again. They are made of rice flour and mine here came in sweet coconut or peanut filling, and then rapidly steamed to cook the flour. It's ready in a few minutes. Bite-sized lightweight snacks and so tasty. Oh yes that green thing underneath is a pandan leaf (pandanus amaryllifolius) which gives a sugary sweet fragrance as well. I love the pandan leaves, for one important reason they prevent horrible cockroaches. Got some knotted leaves in my kitchen cabinet for that purpose! And this is best eaten steaming-hot just as they give it to you because once it has cooled their skin becomes alittle stiff and I like it hot and spongy. Talking about food makes me hungry! I love going to Chinatown/Soho, here in the UK because you see so many yummy deserts! .. you can usually smell before you see though! I never like tu-tu kueh till I try this stall at Bukit Merah Central - Blk 164 Coffee shop. 5 pcs for $2 and they have coconut, peanut and chocolate which is unique. Coconut and chocolate are highly recommended to try! The coconut is very fresh as the stall owner told me they cook the coconut daily. MUST TRY!!! You will never regret!